Ghost images are out-of-focus images of bright sources. Light must reflect an even number of times from lens surfaces. If the source is small each ghost looks like the aperture stop. If the ghost is focused on the image plane, the ghost looks like the source. Since ghosts are based on specular processes, their morphology is fundamentally different from that of scatter. Consequently they are generally specific structures with definite edges, foci, etc. A type of flare occurring when the sun or other strong light source is included in the scene and a complex series of reflections among the lens surfaces causes a clearly defined reflection to appear in the imagein a position symmetrically opposite thelight source. 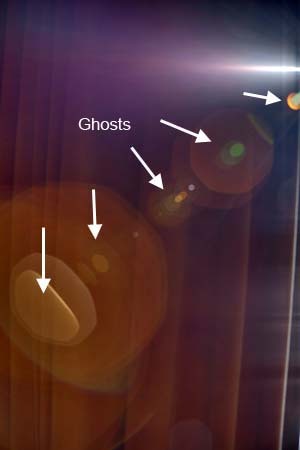 This phenomenon is differentiated from flare by the term “ghost” due to its ghost-like appearance.Ghost images caused by surface reflections in front of the aperture have the same shape as the aperture, while a ghost image caused by reflections behind the aperture appears as an out-of-focus area of light fogging. The sun was shining in an almost entirely blue sky. It is the main source of glaring brightness. The colored ghostly images represent the opening of the iris of the diaphragm. Some are small and some are quite large depending on the location of the start of the final path of the given ghost image toward the digital sensor and focusing (or not) at -or near- the focal plane. 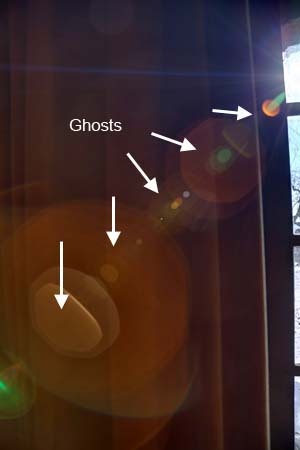 Note: the size and the location on the image of the offending flare ghosts depend on the angle of the object to the lens axis: shooting directly at the sun should not yield any ghost! Hint: true ghost images are always radial aligned and therefore the alignment passes through the center of the image. The sun were here shining from the underside of the camera, on the right of the image. 1) There is no change if the camera is put upside-down for shooting. 2) The artifacts are radially aligned: they are all in line with the center of the image. 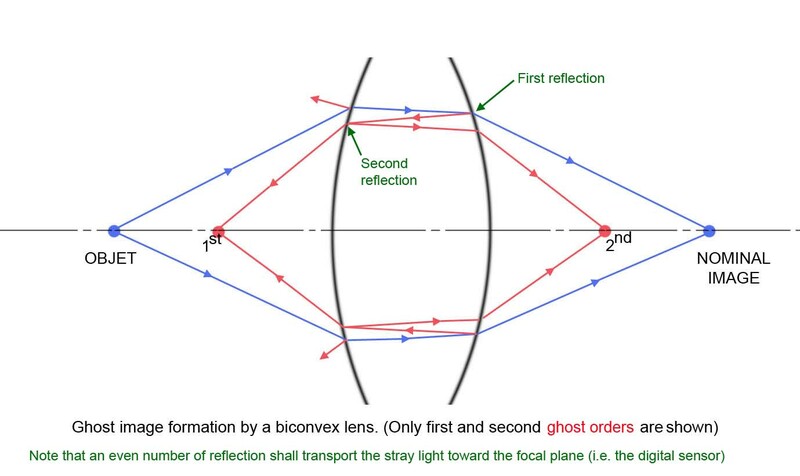 The two observations unveil the origin of the ghost images: it is clearly 100% located within the lens itself. Remark: This flare effect affects many lenses of all focal lengths but state-of the-art and high-end lenses are now almost ghost-free: the lens builders apply very efficient AR coatings on all the surfaces of the glass elements. As a consequence the light transmission is increased and reflections are considerably dimmed. For panorama stitching the Tokina 10-17 mm and the Canon 8-15 mm (both fisheye zoom lens) are excellent in this aspect. The Canon 24-105 mm lens used to shot these present images is... good. The Samyang 14 mm and Sigma 8 mm f4 are the worst of my lens stable.